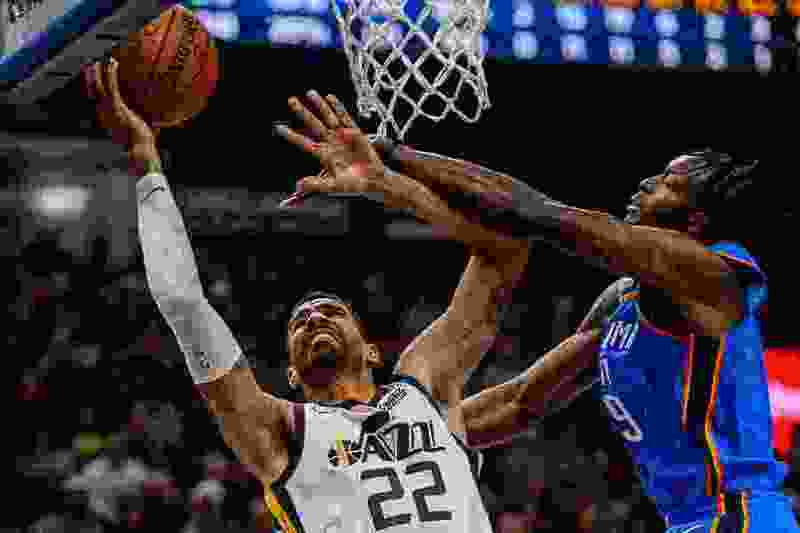 (Trent Nelson | The Salt Lake Tribune) Utah Jazz forward Thabo Sefolosha (22) defended by Oklahoma City Thunder forward Jerami Grant (9) as the Utah Jazz host the Oklahoma City Thunder, NBA basketball in Salt Lake City, Saturday December 23, 2017. From an outside perspective, Thabo Sefolosha was supposed to be a bigger part of the Utah Jazz this season than what we’ve seen so far. Sure, he was due to miss the first five games after being suspended for violating the terms of the NBA’s Anti-Drug program. But even since his return, Sefolosha has still been a non-factor. In those six games, he has appeared in a total of two: against Denver and Toronto. In Denver, he played only three minutes in the first half, missing two 3-point shots, including one off the side of the backboard, and Quin Snyder chose not to play him in the second half. The Toronto minutes were at the end of the game after the Jazz were well and truly beaten; he entered the game at the 6:17 mark of the fourth quarter with the Jazz down 20. And in the two games since, Sefolosha hasn’t played. What’s going on? Truthfully, right now Sefolosha looks more like a player still trying to shake off the effects of injury, and the time off that resulted. “He got hurt last year, and the last six months for him have been trying to just get physically healthy,” Snyder said. When you don’t play for a long time, there’s rust if you don’t play for a week." When • Monday, 6 p.m. In the portions of practice media is allowed to see, Sefolosha is doing activities more typical of players returning from injury than those who are healthy. This week, he’s been seen working one-on-one with Raul Neto, who himself is returning from a hamstring strain. Snyder knows that at some point he’ll have to call on Sefolosha, but wants him to be closer to his best when that time comes. Snyder also noted that other players at that position have played well. Georges Niang has picked up backup minutes at the stretch-four spot, and has started the season shooting well: 50 percent overall, and 47.6 percent from 3-point range. His impact has slipped in the last week or so, however: the Jazz have been outscored with Niang on the court in four of the last five games. That’s also meant more minutes at the position for Jae Crowder, who has been excellent to start the season. He’s averaging 14.7 points per contest, which would be his highest scoring average of his career. He’s also shooting the ball well: 45 percent overall and 35 percent from 3, while playing very solid defense. So far, he’s approximated the impact of his 2015-16 breakout season, when he was heralded as one of the best role players in the NBA. But while Sefolosha isn’t playing on the court, Snyder and teammates say he’s contributing off the court. Rubio credited Sefolosha with helping the Jazz stop their four-game losing streak. “The thing about Thabo that’s so important, and it’s really a compliment to his character, is his ability to impact the team in a multitude of ways. His experience, his intelligence, there’s a lot of things that Thabo is able to contribute."